Internal fixation of lower leg bones. 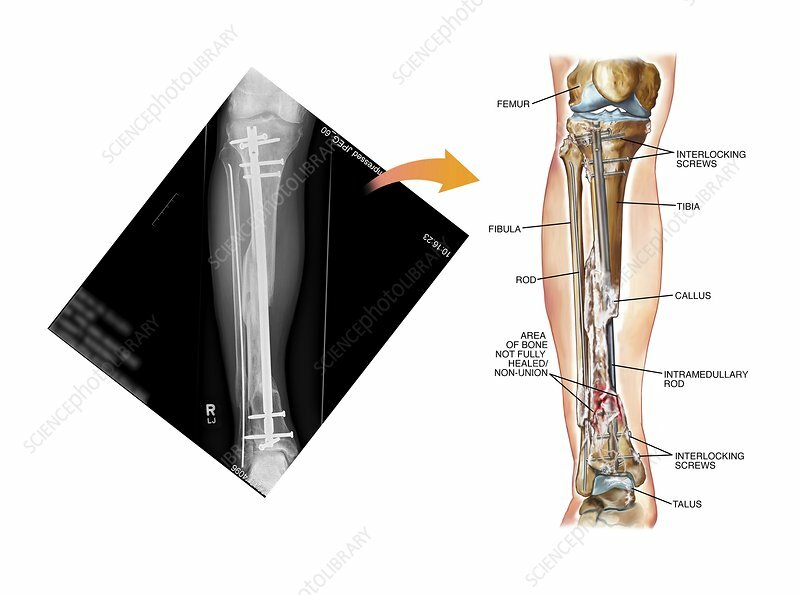 Labelled artwork and corresponding X-ray of internal fixation applied to fractures of the lower leg bones (tibia and fibula) in a patient's right leg. This is an anterior view. Rods and screws have been implanted across the fractures to hold the broken bones in place, allowing them to heal in the correct alignment. These are mid-tibial and distal fibular fractures, treated with intramedullary rods. Also labelled is a callus area of bone, and areas where the bone has not fully healed or unified across the break. At top and bottom are interlocking screws, joining the tibial and fibular rods.